If you currently sell your work online or are considering doing so, here's a very interesting read about various marketplaces. [edit: no longer available] Even though Etsy is the one we hear the most about, there are lots of other options to consider. By the way, the blog's writer, Annie Ridlon is a talented artist, graphic designer, and teacher in Massachusetts who makes beautiful beads from colorful hand painted and hand rolled papers which she then incorporates into jewelry. 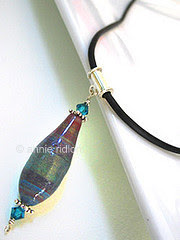 See examples of Annie's Artisan Paper Beads. She mentioned that she is currently working on a selection that utilize her illustrations with original hand painted art papers.